Assessing the ability of a stream to attenuate contaminants is important to source managers who are evaluating remedial options for mining-contaminated streams. U.S. Geological Survey (USGS) researchers studying the fate of metals in Pinal Creek, Arizona—a mining-contaminated stream——have developed a method to quantify the ability of a stream's hyporheic zone to attenuate dissolved metals. The hyporheic zone is the part of the streambed where a mixture of surface water and ground water flows through it. Increased contact of dissolved metals with reactive sediments and microbial communities during the exchange of stream water into and out of the hyporheic zone can enhance metal attenuation. The new method uses the USGS's stream tracer-injection technology, and the technique of sampling water in the hyporheic zone at closely spaced depth intervals. A comparison of small-scale hyporheic-zone measurements with reach-scale measurements (measurements along a continuous or straight stretch of the stream) provides estimates of net attenuation of metal loads. 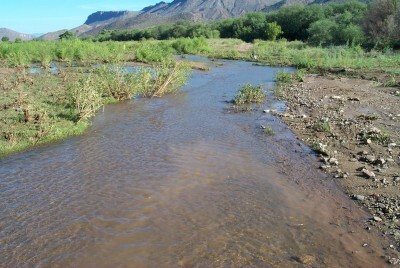 At Pinal Creek, decreases of 12 to 70 percent of the metal loads over 6 kilometers of flow in the stream were attributed to natural attenuation in the hyporheic zone. Fuller, C.C., and Harvey, J.W., 2000, Reactive uptake of trace metals in the hyporheic zone of a mining-contaminated stream, Pinal Creek, Arizona: Environmental Science and Technology, v. 34, no. 7, p. 1150-1155, doi:10.1021/es990714d. Harvey, J.W., and Fuller, C.C., 1998, Effect of enhanced manganese oxidation in the hyporheic zone on basin-scale geochemical mass balance: Water Resources Research, v. 34, no. 4, p. 623-636, 97WR03606, doi:10.1029/97WR03606.